My favorite Indiana Jones movie is Temple of Doom, and I finally got my hands on the Mola Ram figure by Hasbro. The figure was released in 2008 as part of the fourth and last wave of figures. Mola Ram is the main villain from the movie Indiana Jones and the Temple of Doom and the role was played by the late Indian actor Amrish Puri. The character design draws inspiration from several sources, from voodoo to run-of -the-mill european devil-worshipping into one cohesive, undoubtedly evil look. The basic costume consists of an ample, ankle-long black and red tunic, and an elaborate headdress fashioned from a cow skull (a particularly terrifying trait for devout Hindus, or so I am told). The cloak is especially well sculpted, with each fold and wrinkle mimicking the way natural fabric would drape over Mola Ram’s powerful physique. Even though the attire itself isn’t all that complex, Mola Ram is among the most detailed figures in this line, with the minutely sculpted strings of beads around his neck and the pitted texture of the headdress. A particularly impressive touch is the way the sculptor managed to make the sculpted necklace to go from the naked torso of the figure and continue over the rubber upper tunic. The sculpting is so precise that one doesn’t immediately realize these are actually two separate pieces. As mentioned, the tunic is in fact composed of two pieces, one “shirt” piece covering half the torso and a long “skirt” piece covering the legs, with no apparent gap between them. The facial sculpt is the best I’ve seen in the line, with a clear resemblance to Mr. Puri and complemented by a subtle and effective paintjob that captures perfectly the look from the movie. • Ball jointed neck. Good movement range all around, with slightly limited tilting. • Peg & hinge shoulders. The joint works well, although his arms cannot rest too close to the body due to the lateral muscle sculpt. • Peg & hinge elbows. Good. Not quite 90° but has 180° free rotation. • Swivel hips. These are practically rendered useless by the rubber skirt. So, from the hips down, there are no knee or ankle joints. In fact I even doubt there are actually swivels at the hips, but since that is something I cannot confirm without dismantling my figure, I’d rather give Hasbro the benefit of the doubt than risking damage to Mola. Although I would have loved it if Mola Ram had a more dynamic design, let’s face it, the character doesn’t really need to sit or make splits. Luckily the detailing is good enough to make me forgive the figure for being a saltshaker with arms and wicked cool accessories. And speaking of accessories, Mola Ram does come with quite a bunch. The foremost one is the headdress, of course. It is sculpted to resemble being made from a cow skull and it is further detailed with strands of buffalo hair and a tiny shrunken head at the brow. 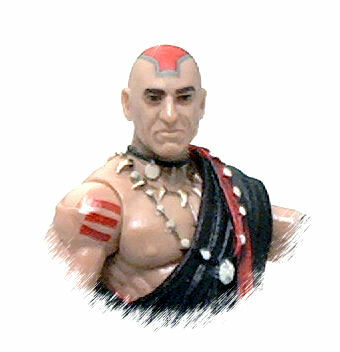 There is also double-sided, red and black fabric scarf which goes over Mola Ram’s shoulders and drapes rather well thanks to it being tightly folded in the package, so the ends of it don’t have a tendency to stick out once placed on to the figure. 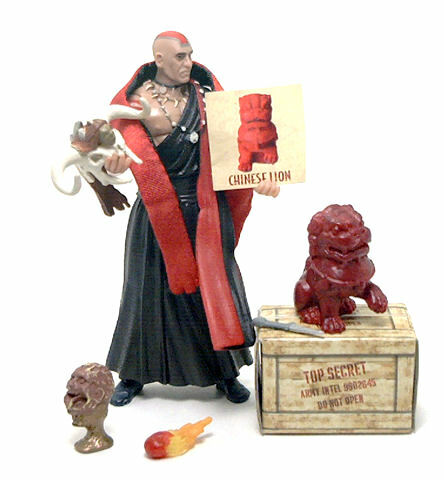 Additionally, The figure comes with a small knife, a flaming heart and the correctly scaled Chalice of Kali. The knife is very tiny and made from light gray plastic, with only the blade painted bright silver. The burning heart accessory is made from translucent yellow plastic and is painted in a way that fades from the deep red of the heart to bright yellow at the flame tips. On the other hand, the Chalice of Kali doesn’t look quite as good, with just a tarnished bronze-colored cup and some pinkish drybrushing applied to the gray severed head on top. To be fair, the Hidden Relic version of the Chalice didn’t look much better, despite being a larger piece, so at least the look remains consistent. Like all of the other figures in the line, Mola Ram also includes a Hidden Relic cardboard crate. Inside the crate there is a Chinese Lion statue and a sticker for the Passport to Adventure Mail-Away promotion. These statues are supposed to bring good luck and Chinese people used to decorate their roofs with them, placing one on each corner. The Chinese Lion is molded in red plastic and was given a slight dark paint wash to add an antiqued patina to it. Despite the limited leg articulation, Mola Ram is one of my favorite figures from the defunct Indiana Jones line, and after a rather lengthy travel, I was glad to finally receive this figure in the mail. I hope the rumors about a possible fifth Indiana Jones movie prove true and we get to see more figures in this line. He was my fav figure from last year. Nice to see someone else who things TOD is the best of the 4 (thought i was alone there). Thanks for all the great comments. If I’d seen him in person, he probably would have been one of my favs. I personally think Raiders is the best of the 4, but it’s also my all time favorite movie.